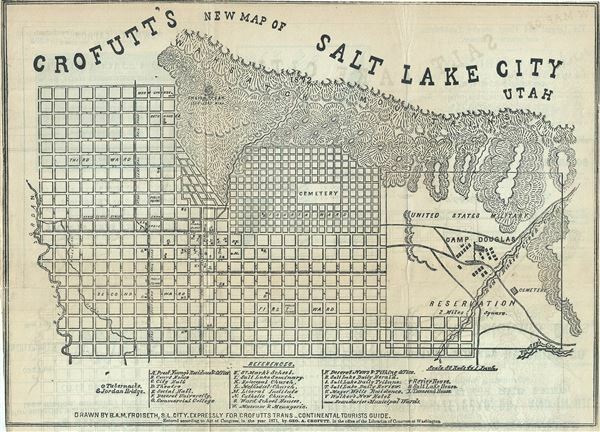 This is a fine 1871 George A. Crofutt map of Salt Lake City, Utah. It covers from the Wasatch (Wahsatch) Mountains south as far as Parley's Creek and from the River Jordon east as far as the Red Butte Creek. The map is highly detailed and notes individual streets and important buildings throughout, with a key below the map proper. The sites marked on the map include the Jordan Bridge, City Hall, theater, schools, government offices, churches, etc. Identifies the Utah Central Railroad and the Utah Southern Railroad. The location of Tabernacle (Mormon Tabernacle) is also noted, which according to Crofutt, was 'The first object one beholds on entering the city.' About Salt Lake City itself, Crofutt wrote 'This is one of the most beautiful and pleasantly located of cities. The streets are wide, bordered with shade-trees, and laid out at right angles.' This map was drawn by B. A. M. Froiseth of Salt lake City expressly for Crofutt's Trans-Continental Tourists Guide, was 'Entered according to Act of Congress, in the year 1871, by Geo. A. Crofutt, in the Office of the Librarian of Congress, at Washington,' and was issued as part of Crofutt's Trans-Continental Tourist's Guide. Very good. Minor wear and verso repair along original fold lines. Minor offsetting.